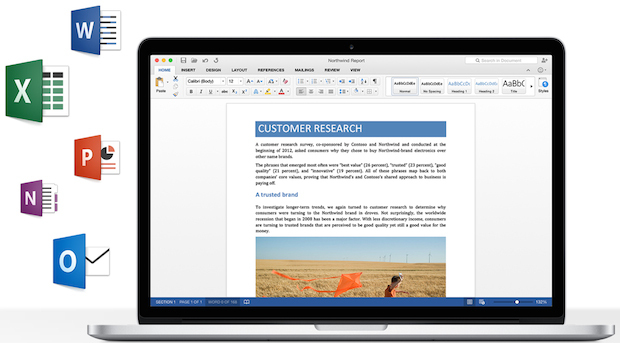 Microsoft has released a free public preview version of the Microsoft Office 2016 Suite for Mac. 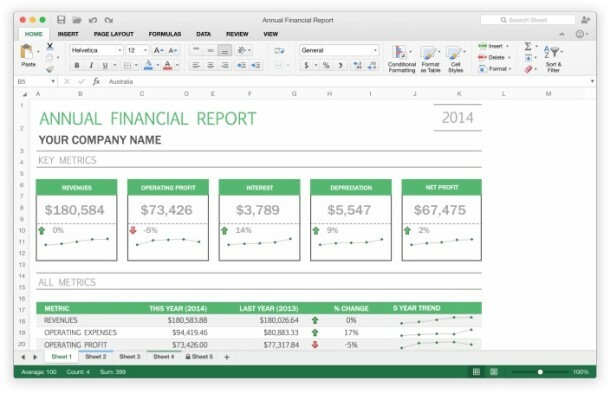 The Office suite includes Word, Excel, Powerpoint, Outlook, and OneNote, which are arguably the most popular productivity apps in existence. 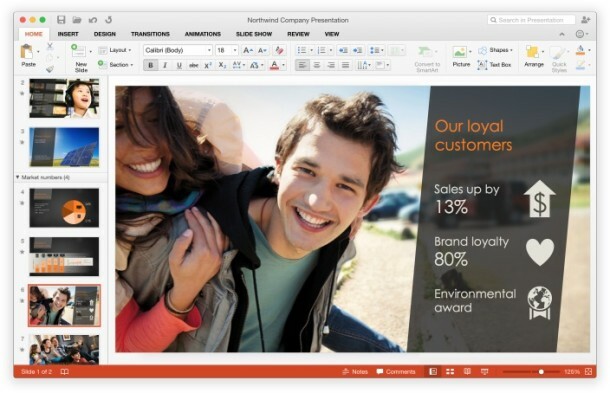 Office 2016 has all of the features of Word, Excel, Outlook, and Powerpoint that you’d expect, plus a variety of new features, including enhance cloud support to be able to store and access document from anywhere, be it the web, an iOS device, another Mac, or Windows PC. The user interface has been redesigned to fit with modern versions of MacOS / Mac OS X as well. The Office suite will remain free as long as the apps are in preview (effectively a public beta). You’ll want to keep on top of updates for the apps, as each preview build will expire 60 days after it has been posted. An included Office for Mac Auto-Update tool will notify users when a new version is available to download. 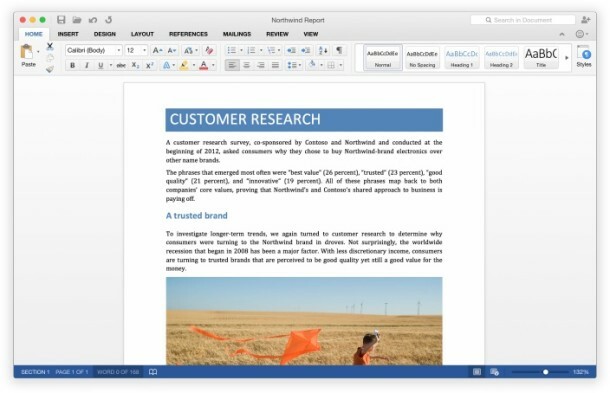 The final public preview build will apparently continue to work for about a month past the official launch date, at which time Mac users who wish to continue using Office 2016 apps will need to pay for the final software. A new version of MacOS is necessary to run the latest Office builds, that includes any macOS release, as OS X 10.10 Yosemite or newer is required to run Office 2016 on a Mac. The preview release will work free but eventually will require payment to unlock the full final version. For those wondering, yes you can run the Office 2016 suite of apps alongside Microsoft Office 2011 for Mac apps. The Office 2016 apps will install in the /Applications/ folder as usual, and can be uninstalled / removed by placing the appropriate applications into the Trash. So, if we’ve subscribed to Office 365 will we automatically get these updates? Wait for the release and you’ll have a better answer. Do we know if this New Suite supports Apples iCloud? Possibly. Word and Excel on iOS allow access to iCloud. Don’t see why they’d exclude it from this. At some point, it ought to: Microsoft’s Office Apps on iOS already support iCloud. Support for iCloud as a cloud saving option doesn’t appear to be built in at this stage; but there’s nothing stopping you saving to iCloud Drive as if you were saving to any other folder on your Mac. So basically, yes – albeit in a slightly more manual way (but not so manual that it’s a complicated hack). In the Office 2011 (include Office 365) with the last update, the user interface aren’t 100% compatible with Retina Display. How are campatibility with Retina Display in this version? Almost 100% retina friendly – definitely more so than 2011. I’ve noticed a couple of icons in the (hidden by default) Developer tab; and for some odd reason the “sliders” for adjusting the margins are also pixellated on a retina display; but everything else is clear and sharp. I’ve already submitted feedback to Microsoft pointing these few omissions out. Word is Blue, Visio is Blue as well as Link (useless). Nothing is Yellow any more. I know right!! Blue is so 2014. Can’t believe they went with blue. What on Earth is Microsoft thinking. Now how am I going to distinguish Outlook, from Word, from Visio. This is insane!! What about Visio? It’s the only reason really that I keep a Windows virtual machine around. No kidding. Native visio for OS X would kill of the Win7 installs I have on 3 machines as well as the VMWare Fusion install supporting them. I’m interested in trying it out, but I really think that time for Microsoft Office has passed. I do pretty much all of my document creation from Pages and Numbers. They integrate better with my Macs and iOS devices. I’m not interested in paying for another cloud service, and certainly not one ran by Microsoft. If Microsoft went belly up tomorrow, I wouldn’t care. They’re so 2000’s. Seeking advice from you gurus…I presently use MS Office 2011 for Mac. If I install this 2016 beta pkg, will it replace my 2011 or be a stand alone app that I can test, try out etc? Don’t install on top of each other, should be fine. You need OS X Yosemite to run this, or newer. Do I need an iPhone 6 for this to work? It won’t download on my 5s. It’s a Mac app, geez. There’s no price to download while it’s in public preview because the preview is free, the cost will be when it becomes paid. Office 365 etc. To try it out it would be nice if the darned software would download… I have tried several times and it takes forever to download – up to the point when it simply stops downloading. If this is any sign of how Microsoft operates (still !!!) it’s not a good sign. I downloaded on two separate Macs, which by the way took forever and when I double click on the .pkg the installer loads and quits immediately. This happens on both Macs running Yosemite latest. Any ideas? This is very frustrating. Same problem, no solution. I have OSX 10.10.3. I also have the same problem. Installer quits without displaying anything, and no error message. I’m on 10.10.2. Same thing here, OS X Yosemite 10.10.2. I was able to install the entire Office 2016 suite against 10.10.3, however Outlook crashes every time on launch. I think MS has gotten enough crash logs now to see what’s happening. If it downloaded all the way it should be 2.66 Gb. If it’s less than that, it simply didn’t download completely and it won’t install, obviously. Agree with Socalflyboy – the download started – says its 2.5Gb. Each time it seems to download an installer package of only 155Mb. The installer package looks complete, but doesn’t do anything – it just sits there when double clicked, or even CTRL Clicked and told to open with INSTALLER. Not the best start!! I’m having the same installation issue—nothing happens. Mine won’t download either. It just sits there, stalled. Thanks for stating the obvious about using Safari. I was using Chrome and just could not get it to completely download. Worked without a hitch in Safari. I have just downloaded the 2016 Office on a mac mini with 10.010.2 it took about 2 minutes. Install was also faultless – about 19 minutes. Will check it out soonest. Looks good, except I can’t get Outlook to start. Keeps crashing at start up. Don’t import your Outlook 2011 preferences. I don’t have the original link, but here’s what you have to do to fix the problem. Shutdown Outlook, execute the following commands from a terminal session, then restart Outlook and DO NOT import anything. Thanks, but no thanks. Long since moved away from Microsoft’s crappy bloated products. Apple should buy them and liquidate everything. STOP! Do NOT install the Preview! You CANNOT uninstall the Preview. Microsoft has made sure you CANNOT remove it from your Mac system. Word (2016) is 1.49GIG in size and that’s INSTALLED! It is a HUGE suite of familiar Microsoft applications. Someone help me get it off my system! I have no space left for other items!!! 1. Go to the Go Menu in your Finder Menu. 2. Go to the Applications Folder. 3. Navigate to the Word, Excel, PowerPoint, Outlook, or OneNote app that you want to delete. 4. Drag the relevant app to your trash. 5. Empty the file from your trash. I played around with it over the last day or so. Dumped the apps into the Trash from the Applications folder. NO problem! No you 100% can uninstall any software on your Mac. You must read the directions well. So far so good. I’ve only had a brief play around so far, but it looks clean, modern and sharp (and has good retina display support too aside from a couple of omissions which I hope Microsoft will fix before the final release). Not using it for serious work at this point, of course, but may use it for notes and small tasks. I know is beta, but Excel is full of bugs. The trackpad becomes unresponsive and suddenly you cant edit cells. You need to restart the app. I have had the same problems with Excel that a lot of users here have stated. Every 5 minutes or so Excel becomes unresponsive and you can not click inside a cell. You can still navigate cells with your arrow keys, but you can not drag and select. If you scroll all the way to the left a few times, it seems to unfreeze it and Excel becomes responsive again. Also, if you are scrolling down the page just freezes and bounces back and forth. I had multiple windows open at one point, going back and forth between spread sheets and it came to a crawl. Some updates or something are needed for this. For the trouble I’m having, might as well use Google doc’s and make sheets. I’m having the same problems as Chris. This beta is definitely not ready for primetime, release. That’s why it is a beta, a beta means it is in development, not yet stable, nor ready for primetime. I’m having the same problems…glad I am not the only one and yes, I absolutely understand the purpose of a beta release! I have a problem in that outlook won’t activate. It says there is no account linked to my subscription despite the fact that I this is a free preview. The other apps are no problem – any advice? I am getting a notification that my preview will be ending in 6 days. Is there any way to continue with the beta (only having one problem) or will I have to downgrade until the new version officially ships?! same question, my preview will be ending in a few days, what should i do? same boat as you guys – really dont want to pay for the downgrade!? I singed up for Office 365 knowing that finally after 5 years a newer mac version is out there. WHAT A DISAPPOINTMENT. After 5 years all we got was some fluffy cloud file saving BS. Yeah, they added colors to the menus, but beyond that I don’t see much groundbreaking, time saving enhancements. Sure, everything crashes constantly, but that’s to be expected with software releases these days from any vendor. But seriously, it could have been so much better than it is. The fact that you cannot customize the quick access icons at the very top is sad beyond all words. What a time saver that is and has been on Office windows since 2007 !!!. I’m glad I only purchased month to month. I used Office 2016 for 10 days and then uninstall the whole damn suite. Good riddance. I’ll stay with dodgy Office 2011, at least I won’t be paying a subscription rate for software that’s the same as I what I already use now. Save your money. For free,means without charge: This download requires that you enter credit card information. It’s only free for the first month!